Brokering Servitude: Migration and Political Economies of Domesticity in the United States, 1850-1924 (NYU Press, Fall 2017). Available for purchase through NYU Press or on Amazon. With Caley Horan, “Who Bears the Burden of Risk?” Inside Higher Ed, October 21, 2016, https://www.insidehighered.com/views/2016/10/21/personal-liability-insurance-shifts-burden-risk-institution-individual-essay . “A lesson from history about protecting migrant workers,” Public Radio International (PRI)’s, The World, June 2, 2016, http://www.pri.org/stories/2016-06-02/lesson-history-about-protecting-migrant-workers. Vernon Ichisaka checks the weight of beans picked at Seabrook Farms in 1950. Courtesy of the Rutgers University Community Repository and the Seabrook Educational and Cultural Center. “Restricted Cargo: Chinese Sailors, Shore Leave, and the Evolution of U.S. Immigration Policies, 1882-1942,” November 2018. Published as part of “People-Works: The Labor of Transport,” a peer-reviewed online exhibit hosted by the Mobility in History Blog, the online publication of the Transport, Traffic, and Mobility (T2M) association. “Social Work and Substantive Justice: The International Institutes’ Response to Discriminatory Immigration and Naturalization Laws, 1924-1945,” Journal of American Ethnic History 37, no.1 (Fall 2017): 5-29. “Digging Up the Backyard: Seabrook Farms and the Importance of Critical Local History,” invited submission to the “Teaching New Jersey History” section of New Jersey Studies: An Interdisciplinary Journal 3, no. 2 (Summer 2017): http://dx.doi.org/10.14713/njs.v3i2.91. “The Advantages of Empire: Chinese Servants and Conflicts over Settler Domesticity in the ‘White Pacific,’ 1870-1900.” In Daniel Bender and Jana K. Lipman, eds., Making the Empire Work: Labor and United States Imperialism (New York University Press, 2015), 239-268. “Imperial Divisions of Labor: Chinese Servants and Racial Reproduction in the White Settler Societies of California and the Anglophone Pacific, 1870-1907.” In Elise van Nederveen Meerkerk, Silke Neusinger, and Dirk Hoerder, eds., Towards a Global History of Domestic and Caregiving Workers (Brill, 2015), 296-322. “Yun Ch’i-ho’s Alienation By Way of Inclusion: A Korean International Student and Christian Reform in the ‘New’ South,” Journal of Asian American Studies 17, no. 3 (October 2014), 305-336. “Asylum in the Midst of Chinese Exclusion: Pershing’s Punitive Expedition and the Columbus Refugees from Mexico, 1916-1921,” Journal of Policy History 23 (Spring 2011): 204-29. “Irish Domestic Servants, ‘Biddy,’ and Rebellion in the American Home, 1850-1900,”Gender & History 21(August 2009): 263-86. With Jeff Manuel, “‘You Can’t Legislate the Heart’: Minneapolis Mayor Charles Stenvig and the Politics of Law and Order,” American Studies 49(Fall/Winter 2008): 195-219. With Lisa Blee, Caley Horan, Jeff Manuel, Brian Tochterman, and Julie Weiskopf, “Engaging with Public Engagement: Public History and Graduate Pedagogy,” Radical History Review 102 (Fall 2008): 73-89. “‘Rooted in the Americanization Zeal’: The San Francisco International Institute, Race, and Settlement Work, 1918-1939,” Chinese America: History and Perspective 20 (2007): 95-101. “The Chinese Must Go! But, Who Keeps Them?” The Wasp, May 11, 1878. Courtesy of the Bancroft Library, University of California, Berkeley. Guest editor, with Chantel Rodríguez, “Immigration Control and Resistance: Historicizing the Present Moment,” special issue of the Journal of American Ethnic History, 38, no. 2 (Winter 2019). The above issue includes a forum that Chantel and I excerpted and edited, which originally took the form of a roundtable discussion at the American Historical Association’s annual meeting in January 2018. The roundtable discussion brought together two immigration attorneys, Luis Mancheno from the Bronx Defenders, and Rebecca Press from Central American Legal Assistance, and two senior immigration historians, Julie Greene from the University of Maryland, and Madeline Hsu from the University of Texas. The roundtable examined how immigration historians and legal aid providers might learn from each other, and explored possible collaborations centered around public and civic engagement. It can be accessed here. 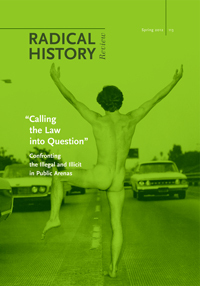 Guest editor, with Amy Tyson, “Calling the Law into Question: Confronting the Illegal and Illicit in Public Arenas,” special issue of the Radical History Review 113 (Spring 2012). Co-author, with Tyson, “Editors’ Introduction,” 1-11. “Under One Roof: Review of the Lower East Side Tenement Museum’s Tour of 103 Orchard Street,” The Public Historian 40, no. 4 (November 2018): 169-176. “Art as an Ally to Public History: Review of 12 Years a Slave and Django Unchained,” The Public Historian 36, no. 1 (February 2014): 81-6. “Meaningful Designs: Orchestrating the Immigrant and Ethnic Landscape,” in the Journal of Urban History 39 (May 2013): 560-9. Exhibition review of The Great American Hall of Wonders: Art, Science, and Invention in the Nineteenth Century, Smithsonian American Art Museum, Journal of American History 99 (June 2012): 266-9. “Commodity Production and the Sociology of Work: Ideologies of Labor and the Making of Globalization,” in “Global Commodities,” a special issue of International Labor and Working-Class History 81 (Spring 2012), 136-48. “Legends of Deadwood,” Journal of American History 94 (June 2007): 224-31. Review of HBO television series Deadwood, the Adams Museum, and other historic sites in the town of Deadwood, South Dakota. Exhibition review of the Mill City Museum in Minneapolis, Journal of American History 92 (Dec. 2005): 938-42. Image from Twelve Years a Slave, 1853. “Brokering Servitude,” The Page 99 Test Blog, March 4, 2018, https://page99test.blogspot.com/2018/03/andrew-urbans-brokering-servitude.html. “Migrants, All: Bridging Conceptual Divides Between Black History and Immigration History,” From the Square, NYU Press Blog, February 12, 2018, https://www.fromthesquare.org/black-history-immigration-history/#.Wrke-IjwbIU. “‘Better Than a Lazy American Husband,’” Lapham’s Quarterly, December 27, 2017, https://www.laphamsquarterly.org/roundtable/brokering_servitude. Excerpted and reprinted from chapter three of Brokering Servitude. “Lifting the Curtain on Living History,” an invited blog post on my experience teaching the article “‘Ask a Slave’ and Interpreting Race on Public History’s Front Line: Interview with Azie Mira Dungey” from the Public Historian. HISTORY@WORK, The NCPH Blog, November 29, 2017, http://ncph.org/history-at-work/lifting-the-curtain-on-living-history. “Guantánamo: The Exceptional Norm?” Guantánamo Public Memory Project Blog (March 19, 2012), http://gitmomemory.org/blog/blog/2012/03/19/reflection-guantanamo-the-exceptional-norm/. “Emory Engages the World: Local Research and the Global University,” Magazine of Emory University’s Manuscript, Archives, and Rare Book Library 4 (Fall 2010).